The Office of Intercultural Engagement is proud to host the third annual House of Privilege at UNCG this Fall! House of Privilege is an experiential event where participants explore the different ways in which privilege is experienced in our society. House of Privilege uses an approach of touring a “home” to highlight privileged experiences and realities we oftentimes do not recognize. 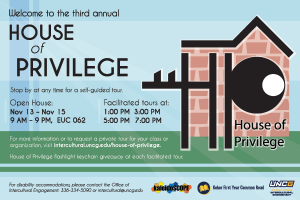 House of Privilege will be hosted in the Office of Intercultural Engagement, EUC #62. Our “Open House” is scheduled from Tuesday, November 13 from 9:00 AM until Thursday, November 15 at 9:00pm. Participants are able to complete a self-guided tour at any time or attend an Open House facilitated tour at 1:00, 3:00, 5:00, or 7:00 any day. During an Open House facilitated tour, you will have the opportunity to tour the House of Privilege with a realtor. This realtor will facilitate a dialogue at the end of the tour to reflect on the privileges portrayed in this year’s House of Privilege. All attendees who participate in a facilitated tour will receive a House of Privilege flashlight keychain. If your class or student organization would like to visit the House of Privilege as a group, we invite you to request a private tour. Private tours start hourly and can be scheduled for any day House of Privilege is open. Private facilitated tours and discussion will last approximately 50 minutes and can be catered to your class or organization. To reserve a tour, please complete this form by Wednesday, November 7th. For disability accommodations, please contact the Office of Intercultural Engagement at 336-334-5090. If you have any questions, please contact Jessica Twitchell at J_Twitch@uncg.edu.